First Row "raw" interlinear text from Paul Radin, Notebook 26: 1-5. Second Row revised text from Paul Radin, Winnebago Notebooks, Winnebago III, #8: 1-3. Third Row corrected text in proper orthography. Fourth Row English translation based in part on that of the interlinear text. nirucdjakdjege esge worak wakatcagaja honigidagikdjonena. nįrušjąkjege. Ésge worak wakąčągają, honįgitagikdjaneną. that you may get well. [So] [story] a holy one, I will tell you. * the translation has, "name of a place," below which is "[Illi]," probably for "Illinois," although McKern says that it is "a landmark on the west bank of the Wisconsin River." hatcinwina hija hakijura hugera erena. hačiwiną. Hižą hakižura hųgera ereną. we lived. [A] husband [the chief] [he was]. * a clear /u/ is written above the somewhat illegible letter here. * hˆ..ñgé[/] occurs just before this word. rahigiji jegu ke ranire," higena. * three letters are scribbled out just before this word. ne roagana yagera." "hisge hine rare,"
ne roagúną, yagéra. "Hisgé hire rare,"
[I] I wish, [I said]. "[So] do so go,"
wąkšigeja wawatekjegiži, hąke haipininą. Haǧakšaną. [at the people] if I were to go, not I didn't like it. I cried. you'll get over it. To brand you it is why I have done it,"
* this would normally be čųhirenįną, but the /h/ has been lost through internal sandhi. hičųšge, wąkšik’įkjege, ésge worak tee honįgitakšaną. [grandson], so you may live, [thus] story this I have told you. * the question mark indicates the place where an letterlike mark appears. * the /e/ between the /n/ and /k/ has been omitted. † /dj/ has been written just before this word. anagere edja nikdjokwarina edja higiginakcana. ánągere. Éja nįkjąkwárina warina éja hįgiginąkšaną. they said. [There] [the children] [my]* [there] they are. * -wánina means "my", and -wanína means "his, her"; but both of these forms are said to refer only to inanimate objects. tce[γ] hakêregê wa-ûñ[·|][/] dejénûñga é[/]. tcegiji hakerege wa’ukdjonena. dejenuga ena. čegiži, hakerege wa’ųkjaneną. Teženųga," éną. when I die, it'll be because I'm going home. This ends," she said. 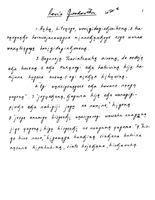 The original texts are in Paul Radin, Winnebago Notebooks (Philadelphia: American Philosophical Society, n.d.) Winnebago III, #8: 1-3 (phonetic text only), and Notebook 26, 1-5 (phonetic text with an interlinear translation).